George Carlin once said, “Electricity is really just organized lightning.” Well, what happens when that lightning gets chaotic? Or unpredictable? Or worse, just up and disappears? If you have any form of electronics at the heart of your IT infrastructure (spoiler alert: you do) then you need to have a nice, steady, organized stream of lightning to your office. Like a firewall between you and the internet, a good Uninterruptible Power Supply (UPS) takes that power from the street and conditions it so your expensive infrastructure doesn’t get fried by a surge. It also uses built-in batteries to keep your systems up in case the lightning goes on a brief vacation. • How much power does all your combined equipment draw at its peak? This includes the servers, switches, firewalls, ISP gear, phone system, and HVAC. 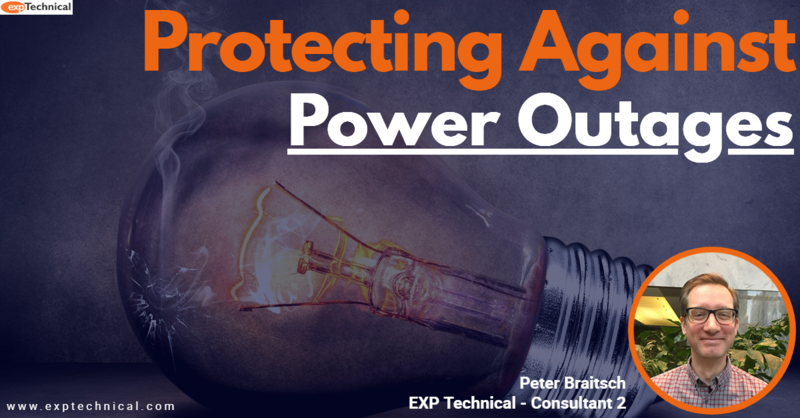 • How long do you want the systems to stay up in the case of an outage? Just enough time to ride out a blip? Or are you running a hospital and need the machines to stay on indefinitely? • How much space do you have to spare for UPS equipment? It can get very big, very quickly if you need a lot of back up power. It’s also very heavy. • Do you have enough power in the server room? You might need an electrician to verify you have enough dedicated circuits to provide enough amperage to power the UPS. • Plan for obsolescence. Batteries must be replaced every five or so years, so include UPS battery replacement costs in your long-term IT budget. What if the lightning was not only organized, but smart, too? Or could at least learn some tricks. Modern UPS equipment can be set up to email or text your IT staff when there are power issues. You can also install a VMware appliance or other UPS software to shut your servers down gracefully after a predetermined amount of time on the batteries and bring them back up once the power is restored. Ask your friendly neighborhood EXP consultant about your backup power situation and how to best plan for the day lightning decides to do its own thing.